"The future of fruit is digital"
In a world that needs the fruit industry to grow and gain efficiency, the question is what the digital transformation can accomplish for the industry, says Mr Chris Komatas, Vice-president of Global Operations for Compac. A growing population requires less food losses and an increase in production. He was one of the presenters in a session on the future of technology at the Produce Marketing Association’s (PMA’s), Fresh Connections: Southern Africa Conference and Trade Show, hosted at the CSIR International Convention Centre in Pretoria. Komatas said fruit and vegetables, along with roots and tubers, have a wastage rate of 45%, which is the highest of any food products. It means that almost half of all fruit and vegetables produced are wasted. He said digital transformation in the fruit industry can mean improvements in profitability. Speed can be improved by increasing efficiency from the farm to the consumer, especially with regard to packhouse and repack sorting. With sensor technology used in other industries such as collecting data from diamonds, data collected by multiple sensors is available on the internal attributes of each fruit. This can lead to a major improvement in efficiency, as data can be handled at a scale of 52 million mandarins per day. The industry is investing in research to establish existing technology into fresh produce with digital transformation across industries. Innovators are already moving ahead with scale and collaboration. Other industries such as financial services, telecommunications, manufacturing, transportation and healthcare informatics are providing a clear roadmap. The extent of digitisation varies by sector though. In a comparison of digitisation by different industries, information and communication technology (ICT) and media are the leaders with relatively high digitisation, with agriculture and hunting at the very bottom of the list. Agriculture falls in a category which is large and localised with low productivity which can transform for productivity and better service delivery. 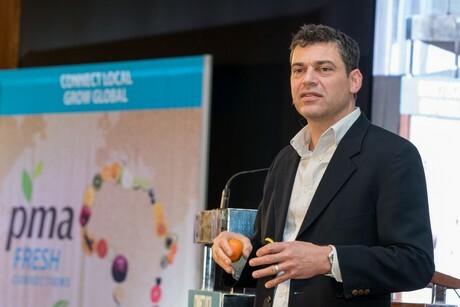 Komatas said digital information can open up opportunities for all role-players in the fruit industry such as growers, producers, packagers, traders, distributors and retailers. With more sorting and grading data available, growers can apply even more precision agriculture in producing their fruit. Provenance and traceability will be much better. Packhouse operations can be more productive and maintenance more predictable. Distribution will be more efficient, providing the right transport at the right time and retail’s last fulfilment will be aligned to the product. • Precision agriculture – using sorting data to inform future farming practices. • Packhouse operations – optimising yield, throughput, and uptime through machine data. • Distribution – reducing waste through alignment of packaging and transport. • Retail – integrating production data with last-mile fulfilment practices.